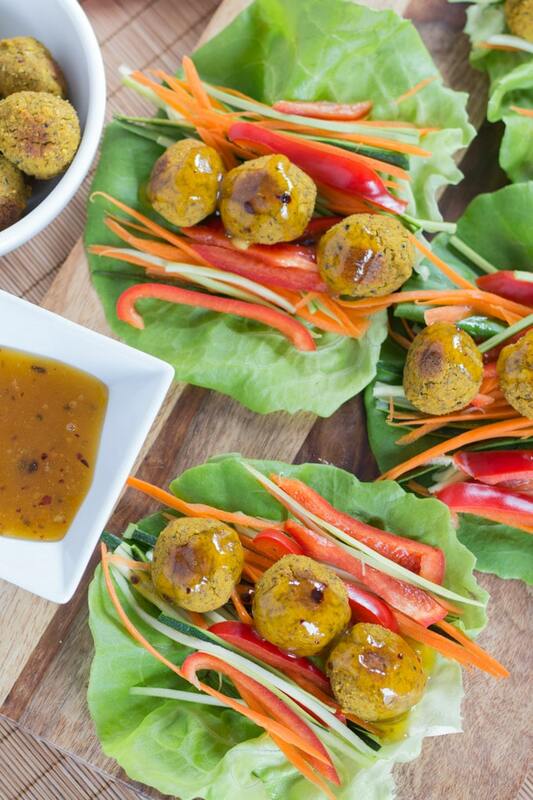 I’m currently loving these Chick Pea and Sweet Potato Lettuce Wraps with Mango Chipotle Sauce! They are packed with veggies and loaded with fibre and protein! This is probably one of the cleanest savory recipes I’ve shared so far. (Well, this Turkey and Prosciutto Zucchini Bake is pretty clean too!). This recipe is also vegetarian and dairy free. And with a little prep work, these wraps can be whipped up for a quick weekday meal. How great is that? I know for a lot of you the summer grilling season has probably already started. I can’t wait to start grilling on a regular basis! For someone who enjoys clean eating, there are so many options for grilling lean proteins and veggies. Plus, you get to eat outside and the clean up is much easier! While the weather here is not quite suitable for backyard barbequing yet, I am so ready for fresh, colourful, tasty food that screams summer! With that in mind, over the past week I’ve been thinking about some light, tasty, colourful recipes that would make it feel more like summer around here. While these Chick Pea and Sweet Potato Lettuce Wraps don’t require any grilling, to me, they look and taste like summer! (I think it’s the colorful veggies and the mango chipotle sauce that make it feel summery!) And, they can be made ahead so you can quickly prepare them for warm summer evenings when you aren’t in the mood to cook or even BBQ! While the veggies in this recipe are great (and bring all the lovely colour), the real magic comes from the chick pea and sweet potato bites. First, they are full of fibre and protein. We are talking chick peas, chick pea flour, sweet potatoes, pumpkin seeds, quinoa, chia seeds and flax meal. (With all that fibre, I wouldn’t eat all the bites at once!). Second, they are really tasty, with a hint of cumin, and super filling. The filling factor makes them perfect for a veggie filled lettuce wrap 🙂 ! And I love how they are crispy on the outside and soft on the inside. The bites can actually stand alone as an appetizer or snack. The first few times I made them, I served them on their own with a dip. Yum! The ingredient list for these chick pea and sweet potato bites is long, but I promise, they aren’t difficult to make. There is a little prep work involved in cooking the sweet potato and quinoa, but once that is done, all the ingredients go in the food processor. Blend, refrigerate, roll into balls and bake. Easy peasy! So before we talk about assembling the wraps (which is pretty simple), let’s talk about the mango chipotle sauce. When I tested these chick pea and sweet potato bites with friends a few weeks ago, I served them with a creamy yogurt sauce. One of my friends suggested that a spicy sauce, similar to a sweet chili sauce, might work better. So after some experimenting, I came up with this mango chipotle sauce. The mango and honey bring the sweet (obviously! ), but the chipotle peppers add some kick. Nothing crazy, just a bit of heat 😉 . And most importantly, you can make this sauce in 5 minutes. 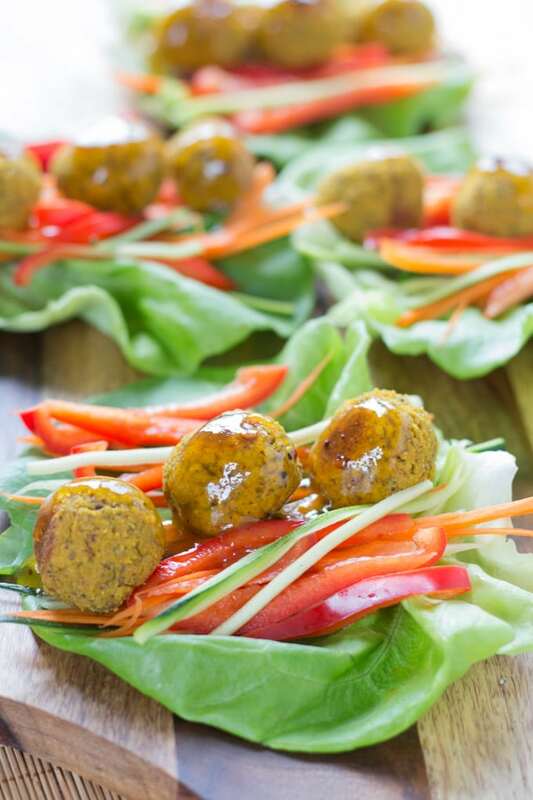 It’s great as a dipping sauce for these bites and adds a subtle sweet heat to these Chick Pea and Sweet Potato Lettuce Wraps. Once the chick pea and sweet potato bites and mango chipotle sauce are ready to go, you can assemble the wraps. Just lay out some Boston lettuce leaves and layer on lots of shredded veggies (I used carrot, zucchini and red pepper). Then add the bites and drizzle on some sauce. Done! 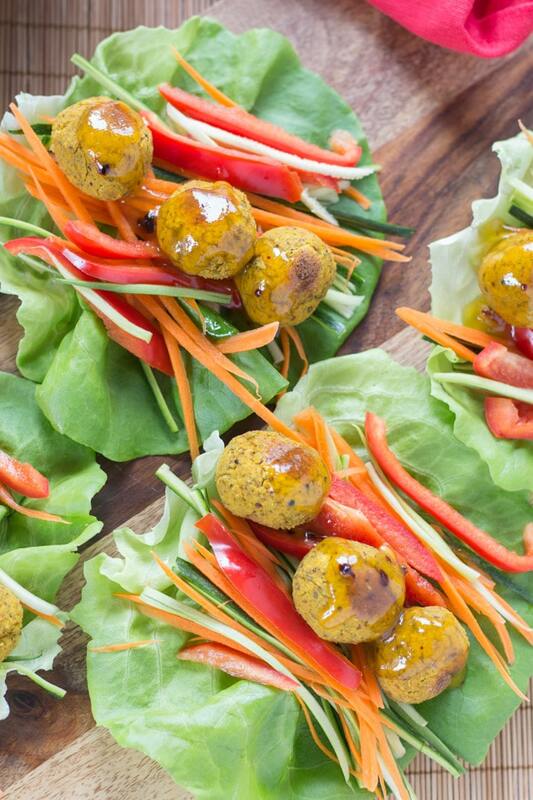 These Chick Pea and Sweet Potato Lettuce Wraps can get a bit sticky and messy, so be sure to have lots of napkins on hand! I’ve been eating these for a few days now and just re-heating the bites in the oven and the sauce in the microwave. These wraps would be great for Sunday meal prep to make ahead for a quick lunch or supper during the week. And since you can get about 30 bites out of the recipe, you could even freeze some for later use too! 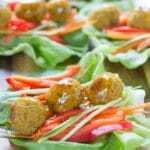 These Chick Pea and Sweet Potato Lettuce Wraps with Mango Chipotle Sauce are light and fresh but oh so filling! 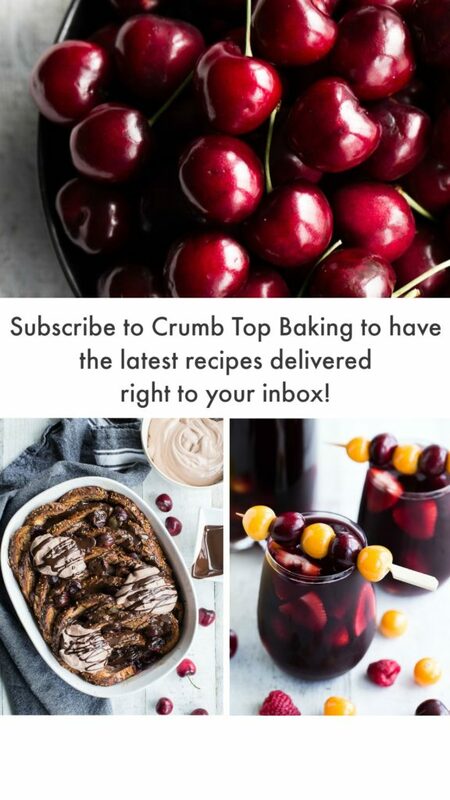 They are clean eating, vegetarian and dairy free and with ingredients like chick peas, sweet potatoes, chia, flax and quinoa, you definitely get your fix of fibre and protein! Add all the ingredients for the bites to a food processor and process on high for 3-5 minutes, or until the mixture is smooth. Place the mixture in the fridge for 2 hours, allowing it to firm up. (This makes it easier to roll the mixture into balls). Pre-heat the oven to 400 degrees and place a sheet of parchment paper on a large baking sheet. 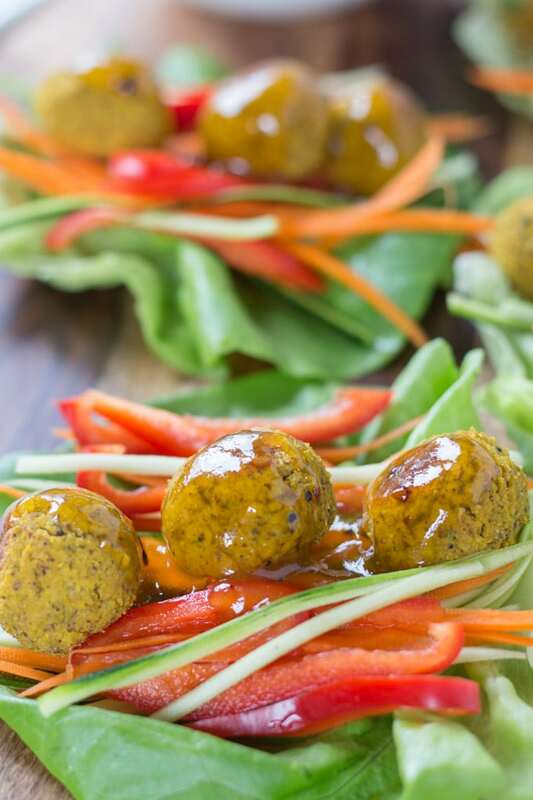 Remove the chick pea mixture from the fridge and roll into balls. (Try to keep the balls small. If they are too large, they will flatten slightly while baking. I usually get about 30 bites from this recipe). Bake for 10-15 minutes until the bottoms are browned. Remove from oven, turn the bites over and bake on the other side for another 8-10 minutes. Add the honey, mango and vinegar to a blender and blend on high until smooth (30 – 60 seconds). Add the honey/mango mixture to a small sauce pan. Add the lime juice and chipotle pepper. Bring to a boil on low heat. Meanwhile, combine the water and tapioca starch in a small bowl and stir until smooth. Once the honey/mango mixture is boiling, reduce heat to simmer and gradually stir in the tapioca starch mixture. Stir until the sauce thickens. Remove from heat. Lay out the lettuce leaves and layer on the shredded carrot, zucchini and red pepper. I used a julienne peeler to shred the veggies. Add three chick pea and sweet potato bites to each wrap and drizzle a spoonful of mango chipotle sauce over the bites. Enjoy! You can make the chick pea and sweet potato bites ahead of time and re-heat when ready to assemble the wraps. To keep the bites crispy, re-heat in the oven for 5-10 minutes on 350. (You can also freeze the bites for later use). Yum! 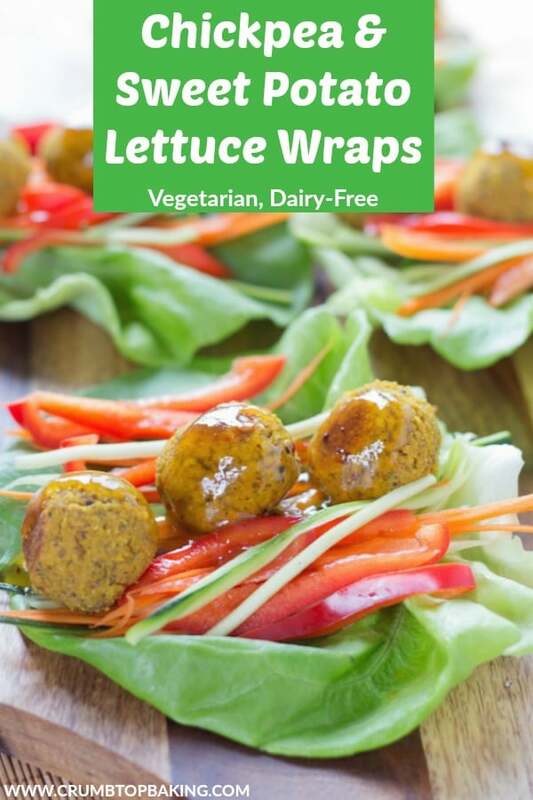 These wraps look absolutely delicious, and I love all of the ingredients. Can’t wait to try them! Thanks so much Colleen! I hope you like them! Can’t wait to try them. I love that your wrap is lettuce, it’s fresher than tortillas. Thanks Nathalie! It’s a great way to get in some extra greens! Thank you for such a delicious, clean eating recipe! That mango sauce looks divine! I definitely plan to try these! Thank you so much Cathy! I hope you like them. Would love to know what you think if you make them! Leanne, I have already printed this and can’t wait to make it. Am dealing with some food restrictions right now, but everything in this is on the “green light” list! Crikey – you can’t imagine how excited I am. Doing a happy dance! That makes me so happy Diane! I hope you enjoy them and I’d love your feedback if you try them! 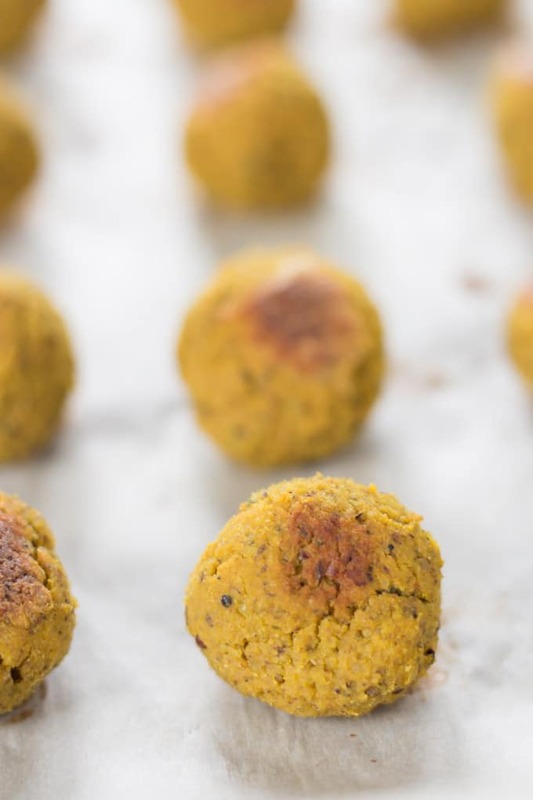 Those chickpea and sweet potato bites look divine! They are exactly my thing! Love that you incorporated them in a lettuce wrap with some colorful veggies. They are perfect for the summer months and when entertaining outdoors! Thanks Nicoletta! Having these on the menu when we entertain outside is a great idea! Now, if only the weather would cooperate! Absolutely love the flavor combination, such a great appetizer! Thanks Lily! I’ve served these bites as an appetizer on their own with the mango sauce for dipping and they were a big hit! These are lovely little bites, Leanne! So attractive and I am sure as flavourful as they look. The fact that you can freeze them is also a bonus. 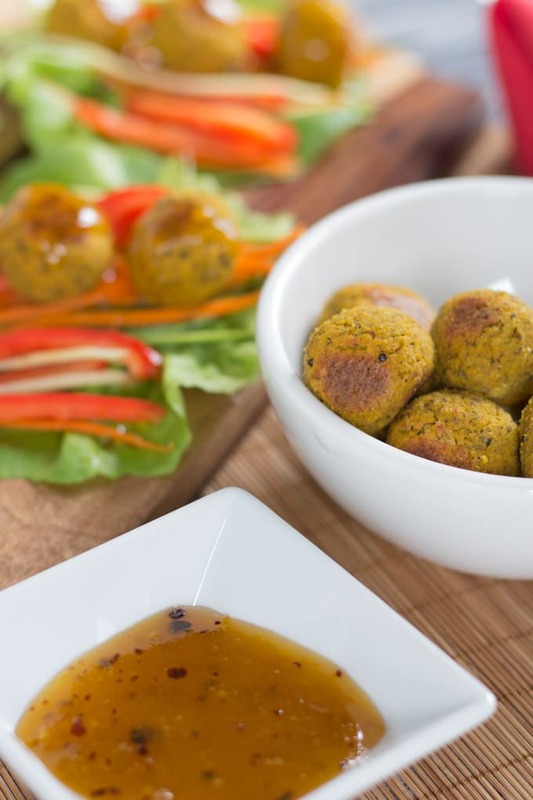 I agree with your friend about the mango dipping sauce – it is perfect for the little chickpea and sweet potato bites. Thanks for sharing. Thank you so much Denise! Being able to freeze these bites is definitely a bonus. Makes them perfect for meal prepping!